Previously located in a moldy and dilapidated space, the new home of the Northwest Arkansas Free Health Center (FHC) is bright and airy, and is located on the University of Arkansas Medical School campus in Fayetteville. The FHC provides a wide range of medical and dental services to those who are without insurance or unable to pay, served by doctors, nurses, dentists and hygienists who are all volunteers. Though in disrepair, the existing building did have a central axis day lit by transoms, and a generous expanse of glass at the south end, which became the public waiting area and conference room. What results is a transparent institution, creating an open and inviting public atmosphere. The exterior of the building was left untouched except for the surgical insertion of a series of windows in the patient rooms and dental clinic, and a new glass entry and cantilevered canopy that provides a covered dropoff for arriving visitors. Along the main axis, wood plank boxes provide a series of waiting areas, with comfortable seating and ample natural light. The circulation to and from patient areas is generous and easily understood. 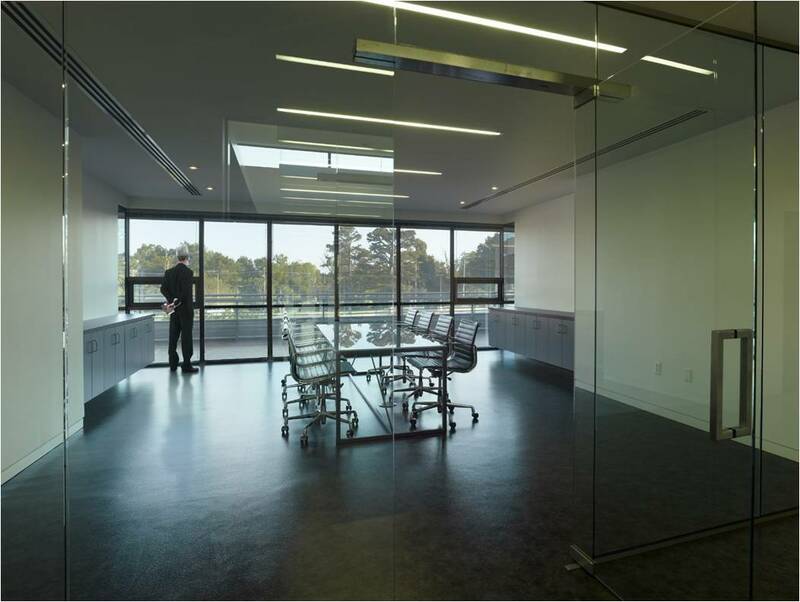 A transparent wall of frameless glass is all that separates the conference room at the south end of the building from the waiting areas, helping to deliver natural light and extend the space out into the landscape. The ideals and mission of the Free Health Center are embodied in the care and craftsmanship executed in the design.